The Ridgeway here in Wiltshire is part of a chain of long-distance paths that run for 583Km, connecting Lyme Regis in Devon with Hunstanton in Norfolk, following the route of the chalk uplands. In a booklet published by the British Geological Society called 'Britain beneath our feet', they say: "Flooding is the major and most frequent recurring natural disaster in Britain. But it is not a new phenomenon and geological information shows where it has happened in recent geological past - in the last 10 000 years. 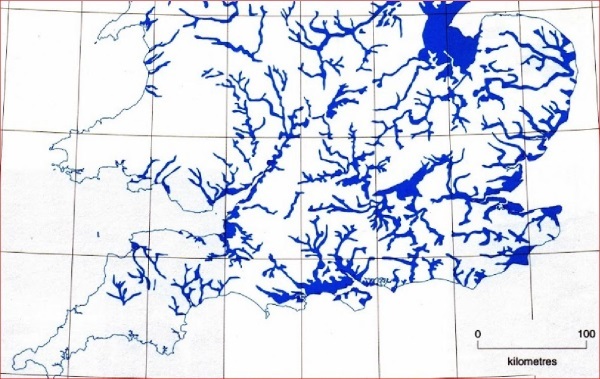 BGS holds data that show where the floodplains occur - the alluvial deposits that compose clay , silt sand and gravel left behind in previous inundations"
Immediately we can see that The Greater Ridgeway didn't just meander aimlessly across southern England's chalk downs. It was in fact the best high-ground route between the west and east coasts of southern England. It was also the driest, with the minimum number of river crossings. The Thames was, and is, the biggest river to cross, but the trail crosses at the narrowest point between Streatley and Goring. Some say the Ridgeway is even older than places like Avebury and Stonehenge, at up to 8,000 years old. If so, the Greater Ridgeway might not have ended where it is now in Norfolk, it might have gone a hundred or more miles into the heart of Doggerland. That was a fertile area which is now under the North Sea, and originally was part of the land bridge between Britain and mainland Europe.